Autumn might very well be Niagara-on-the-Lake’s most beautiful time of year. You just can’t go wrong with the area’s mild weather and stunning foliage. Not to mention, there are so many fun things to do in town during the fall season! Here are some of my favourite Niagara-on-the-Lake autumn activities. There are few better ways to take in Ontario’s dazzling autumnal views than with a peaceful nature hike. Take some reflective time to yourself or bring your whole family to the Bruce Trail or Escarpment Land Preservation. The more kilometers you log, the calmer and happier you’ll likely feel. Some unforgettable views the trails offer include: vast scenes of lovely vineyards, gorgeous orchards, colourful leaves in heavily wooded areas, fascinating remnants of historical settlements, and the ever-stunning Lake Ontario. 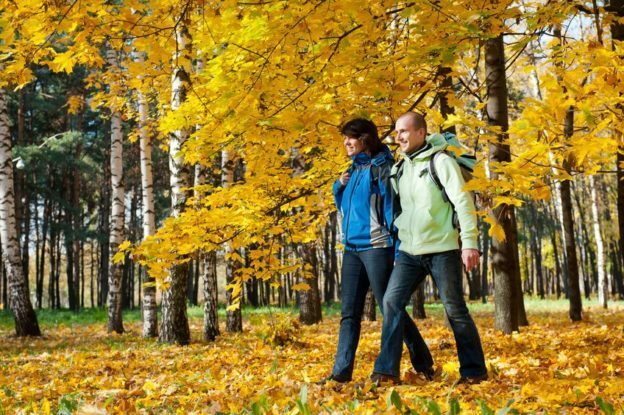 Trust me: You won’t regret taking the time to breathe in plenty of that crisp fall air! Looking for a fun weekend activity? There are several breweries to choose from in Niagara-on-the-Lake. You might consider Oast House Brewers on Niagara Stone Road or The Exchange Brewery on Queen Street. For a particularly unique experience, try the Silversmith (which you can also find on Niagara Stone Road). Located in a church, Silversmith is a small and independently owned brewery serving award-winning beers (you’ll have your choice from golden ale, black lager, and Bavarian breakfast wheat, just to name a few). What’s as incredible as the tasty drinks is the brewery’s rustic atmosphere: The church is from the late 19th century and features exposed beams as well as brick walls. With its abundance of charm, there is no cozier place than Silversmith’s to enjoy a delicious pint of beer on a chilly autumn afternoon or evening. Just because you live here doesn’t mean you can’t embrace the town’s wonderful tourist attractions! Seriously, they appeal to people for a reason, so why not take advantage of all the incredible activities Niagara-on-the-Lake has to offer? Check them out below. What better way to celebrate autumn than with a Fall Colours Cruise on the beautiful Niagara River? Ideal weather paired with striking views of trees that are bursting with red and orange leaves guarantee an amazing fall day! Historical commentary is provided and children’s activities will be organized, meaning entertainment for the whole family. Additionally, you’ll be able to peruse as well as enjoy the cruise’s hearty menu of both local foods and craft beers. Happening from 11:30 am until 1:30 pm, you can attend the cruise any Saturday in October as well as the first Saturday in November. Just be sure to call in advance for ticket purchases and dining reservations! Eager to find the perfectly spooky Halloween activity? On Sunday, October 30th, Niagara-on-the-Lake hosts an eerie two-hour walking tour through historic Fort George. Ghost stories are told throughout, and the mysterious Officer’s Quarters—which are usually restricted during the summer—will be open! If you’re busy that weekend or find that tickets are already sold out (be sure to buy them in advance! ), check out the other ghost tours happening earlier in October. With the Niagara-on-the-Lake Ultimate Foodie Tour, you’ll enjoy a relaxing and fun three-hour walk through the charming town while tasting incredible local foods. The hospitable guides will show you historical landmarks during the walk as well as introduce you to chefs and restaurant owners as you explore. You’ll learn about the rich history of the area and delve into its culture. Even if you’ve lived here a long time, there’s a good chance there’s much you don’t yet know! The tours happen Thursdays through Sundays, and vegetarian options are available if requested in advance. This entry was posted in Blog, Uncategorized on October 12, 2016 by Kevin Stokes.